The thing about knitting is that when you are a beginner, some poor, non-knitting soul, usually a relative, in my case my sister, is gifted with some hideous scarf that she then feels obligated to wear. Last year I made my sister just such a creation, from some wool intermixed with ribbon. 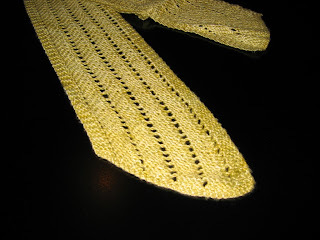 I used needles that were too small and instead of achieving an airy, lacy looking piece of wearable art, I managed to create this thick, ugly scarf that probably makes someones neck disappear from their body...or better yet, makes them look like they are wearing a neck brace. Thank goodness I forgot to take a picture and don't need to display it to the world. This is done in silk/bamboo. My second project. It was hard. That wool is delicate and it was a lace pattern. Never do a lace pattern as your second knitting project. 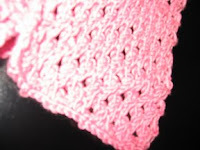 This little baby was my first project, also a lace stitch...again, never start with lace as your beginner's knitting project. This was done in a Debbie Bliss cotton...kind of hard to work with for a beginner. The problem is I am procrastinating about getting past the scarves. I ventured into making a sweater - it is straight knit and purl after all - but the thing has been sitting there completed and now I need to put it together. I started to...but it's laborious, boring, big fat seams...I am not sure I can handle this kind of angst. So it just has not been sewed together. Thank goodness I have my sock class tomorrow and hopefully I won't spend like a thousand gazillion dollars at the yarn store. These lessons are beginning to cost a lot of money because every time I go, I end up buying yarn, or a pattern, or something.